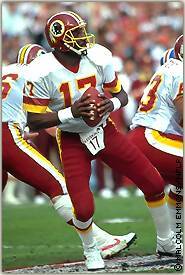 Doug Williams shocked the NFL--twice. First, as a second-year quarterback he took the moribund Tampa Bay Buccaneers to the 1979 NFC Championship Game. Second, after appearing in only 5 regular-season games with the Washington Redskins in 1987, he had the greatest quarter in Super Bowl history. Much was expected of the Grambling State All-American when he was selected by Tampa Bay in the first round of the 1978 draft. The Buccaneers went 5-11 in his rookie year, but that was a tremendous improvement over the 2-26 record the team had put together in its first two years of existence. In 1979, Williams not only guided the Buccaneers to their first winning season, but also their first division title and their first playoff victory. The Los Angeles Rams squeaked past Tampa Bay 9-0 in the NFC Championship Game. Williams led Tampa Bay to a division title in 1981 and another playoff berth in 1982, then joined the United States Football League in 1983. When the USFL folded in 1986, Williams turned down offers to start and became a backup to Jay Schroeder in Washington, reuniting with Redskins coach Joe Gibbs, who had been Williams's offensive coordinator in 1978. Williams attempted just 1 pass in 1986, as Schroeder passed for more than 4,000 yards. But Williams proved to be a valuable reserve the next year, replacing an erratic Schroeder by season's end and leading the Redskins to close playoff victories over Chicago and Minnesota to win the NFC title. With the Redskins trailing Denver 10-0 entering the second quarter of Super Bowl XXII, Williams exploded for 228 yards and a record 4 touchdowns--in one quarter. By halftime, Washington had a 25-point lead and easily won 42-10. Williams earned MVP honors for his record 340-yard passing performance, despite undergoing a root canal the day before and injuring his knee in the first quarter. A back injury forced him to retire two seasons later, but Williams went on to author a book, Quarterblack, and start a coaching career. After one year as coach at Morehouse College, he returned to his alma mater in 1998 to succeed legendary coach Eddie Robinson at Grambling.